NEW POLL: Colorado voters overwhelmingly favor a Red Flag Law – Keating Research, Inc. 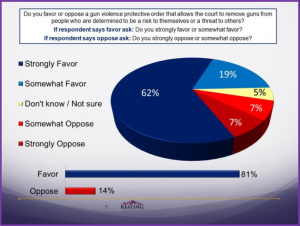 In a poll of likely November 2018 voters statewide in Colorado, 8- of-10 (81%) favor what is commonly known as a Red Flag Law – a gun violence protective order that allows the court to remove guns from people who are determined to be a risk to themselves or a threat to others, while only 14% oppose it. The passion is on the side of those favoring this red flag law: 62% say theystrongly favor it compared to only 7% who strongly oppose it – a ratio of nearly 9-to-1. This Red Flag Law which is currently being debated in the Colorado State Legislature is strongly supported by the vast majority of voters across the political spectrum: 9-of-10 Democrats (92% favor), 8-of-10 Unaffiliated (79% favor) and 7-of-10 Republicans (73% favor). The poll is divided evenly by party registration among Democrats (32% of voters), Unaffiliated (34% of voters) and Republicans (34% of voters). By ethnicity – Hispanic (88% favor), African American (78%) and White (81% favor). This Red Flag Law is also broadly favored by voters in all of Colorado’s key regions – including in the Denver / Boulder / Broomfield Region (88% favor), the bellwether counties of Arapahoe / Jefferson (76% Favor), the suburban counties of Adams / Douglas / Larimer / Weld (84% favor), the Colorado Springs Media Area (77%) and in the Rural Counties (79% Favor). Most telling of the breadth of support for the Red Flag Law is that it is supported by 3-of-4 voters who live in a household with a gun (77% favor). The overwhelming support seen here for this Red Flag Law suggests that getting this done in the 2018 Legislative Session is very important to Colorado voters. Keating Research is recognized by Democrats and Republicans alike as providing extremely accurate polling in Colorado. This poll data is based on live interviewer telephone surveys among a random sample of 600 likely November 2018 voters statewide in Colorado, including 55% conducted on cell phones and 45% conducted on a land line, from March 15-18, 2018. The sample is representative of likely November 2018 voters based on gender, age, ethnicity, region and party registration. The worst-case margin of error at the 95% level for the sample of 600 is + or – 4.0%.